Crowood Press, 2016 (and just $30 on Amazon). The myth of the perfect stroke? Rowing is a strange sport. It is a complex motion, and the race distance of 2km require a difficult combination of brute power, efficiency, and technique. Pulling the oar, the rower has no insight in how his rowing looks, but he knows precisely how it feels. He knows if he hangs at the handle, or pushes with his legs. He knows when he swings his trunk and which muscles are employed when. He feels the boat moving, and he very clearly feels when the crew members fall out of rhythm, everything suddenly becomes much harder, and rowing Nirvana seems impossible to achieve. From the coach launch, you have no insight in what the rower feels and how the boat moves. The only thing you can do is observe the movements of the rowers’ body parts, see how the crew row together, and see the boat surge and pitch. Finally, it is very easy to get taken away by the almost mystic feeling of “boat run” and the beauty of seeing a crew, on perfect flat water, moving perfectly in sync. And although every rower I know has this notion of being in search of “the perfect stroke” (and some claim to have performed one), there is very little scientific description of what that perfect stroke should look like. As a result, every rower has a mental picture of how good rowing “feels”, and everybody has a mental picture of how good rowing should look. Thus, we have rowing styles. And we have beliefs. Coaches teaching opposite things, telling their rowers to focus on different things, and the “art” of rowing is flown down through generations of “families” of rowers, without much scientific scrutiny and real understanding. We see a successful crew with a distinct rowing style, so we believe that they row more efficiently (even though they may just have a better physiology), and we copy their style. Sometimes without even checking if we got faster in the process. It is sad that there is so little consensus over the basic mechanics of rowing. Since Newton, classical mechanics hasn’t changed much. All the necessary science is known and undisputed, so their should be very little room for arguments, provided you define the system well and agree to accept the basic facts of science. I guess there is where the problem is. In times where facts seem less important than opinions, and there is no requirement that opinions are supported by facts, one should not be surprised to hear the craziest claims about rowing biomechanics. Well, I am still surprised. I thought that the rowing community had a relatively high level of education. Also, rowing is a very simple sport. The shell that reaches the finish line first, wins. So, one would think that those who are focused on results would have figured out that it pays off to listen to science. Luckily, there are some who do. Valery Kleshnev is doubtlessly the expert on rowing biomechanics. 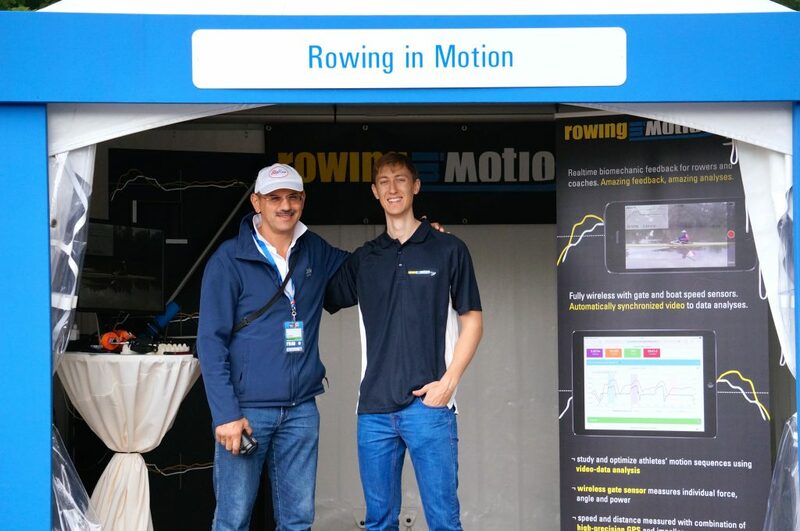 An Olympic rowing athlete himself, he has worked in the rowing biomechanics field since the 1990s. Everybody with an interest in rowing technique and an internet connection must have come across his BioRow Newsletters. By working with top athletes over twenty years, collecting value biomechanical as well as statistical data, Kleshnev has helped the rowing community tremendously in understanding the rowing stroke, and correcting some misconceptions about rowing. In his recent book “The Biomechanics of Rowing”, he provides the core knowledge from his 2 decades of experience, and I see the book as a summary of the various newsletters that he has published. I presume that that is also how Kleshnev sees it, replacing the newsletters which were about science being made (including confusion, hypotheses which later are falsified, etc) with the current state of the art. The timing of the book is excellent, because with the current developments in sports related gadgets, including cellphones with reliable accelerometers, power measuring oarlocks, and an abundance of affordable video cameras, measuring what you are doing in the boat is going to be dead simple and inexpensive. So it is good that there is a volume that summarizes how to make sense of the data, and gives you the latest insights on the most efficient rowing technique at the same time. The book’s organization is very logical. It starts with the different measurements that you can perform on the system, and discusses pros and cons. For example, Kleshnev describes very well why it is hard to measure the stretcher force. In this section, he also describes the basic mechanical equations that govern the propulsion of the boat. In the next section, he describes what determines the efficiency of the rowing stroke, as well as it’s effectiveness. Finally, he goes into detail on the implications of this on technique, which in my mind results in a description of that “perfect stroke” that we are all seeking to achieve. This, to me is the highlight of the book. 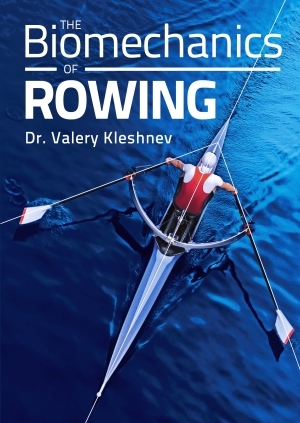 Kleshnev continues to describe rowing equipment, and statistical analysis of rower’s performances over the past century, but the main reason to buy this book is to learn what the perfect stroke is and how you can measure how close you are to achieving it. Having a more than average interest in this field, I can of course find some examples where I would have written up things differently. In this section, I will go into a bit more detail on a few sections. I may sound critical, but I want to say upfront that I think Kleshnev has done the community a great service by writing the book, and my “critical” remarks are made in that spirit. One point of critique is on the explanation of the physics. Explaining physics to lay people is always hard. Luckily, Kleshnev doesn’t shy away from diagrams and equations, but I am still afraid that he manages to confuse most of his readers. Starting at page 28, for example, he takes half a page to explain the difference between velocity and speed, where a simple diagram would have sufficed. He then goes on to use a wedge as an analogy to explain force applied at an angle to the speed. He uses terms like “the force is magnified”. Here, I would just put a simple explanation about Work and refer the reader to his high school physics knowledge. To my taste, the force diagrams, where Kleshnev composes force into axial and normal components in different ways, are overly complex and confusing. You could argue that I am being elitist, and that Kleshnev just tries to explain the principles in terms that people without a physics education can understand. I once taught a course of classical mechanics to Chemistry Students. For each classical mechanics problem, there are various ways to explain what is going on. You can talk about force and acceleration, or about power and kinetic energy. Knowing how to best attack the problem was one of the skills I tried to teach to these students. But for the weakest, I just explained “this is how you solve this problem” and I religiously stuck to one framework, to minimize the student’s confusion. I think this is how Kleshnev should have done it as well, keeping the diagrams simple, using just one framework at a time and not trying to explain everything at once. It is a minor issue, of course. Those who want to work with the rowing mechanics will have to write down the equations and internalize them themselves, and they will discover automatically that equation (22) on page 51 is wrong, for example. Still, a next edition should correct this, because it might lead to incorrect rigging corrections by an uninformed coach. But despite these minor errors, all of Kleshnev’s conclusions are correct, and it is great to have them written up so clearly in this book. On page 59, for example, where Kleshnev illustrates how shorter catch angles make you work at higher peak force in order to keep up with the competition, with accelerated muscle fatigue as a result. Length! Length! Length! In rowing circles there have been long, semi-educated discussions about blade efficiency. I am very happy that Kleshnev has found the jet engine analogy that he uses on pages 69 and further to show where the efficiency argument stops being useful and how to go beyond it. I would almost start believing that publishing these few pages on rec.sport.rowing would make some recurring arguments stop. But that would be very naive, of course. Usenet is for publishing your “opinion”, not for discussing facts. An interesting point is made on page 74, on the effective coordination of muscles-antagonists activities. 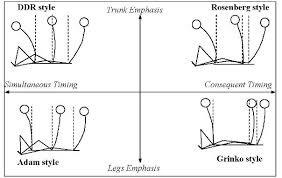 It turns out that by sequencing legs-trunk-arms, you avoid a situation where your quads and hamstrings work against each other: when rowing with a “simultaneous style” (meaning that your trunk starts to open up immediately after the catch) the quads pull the pelvis forward and flex the hips, while hamstrings and glutes try to extend it. 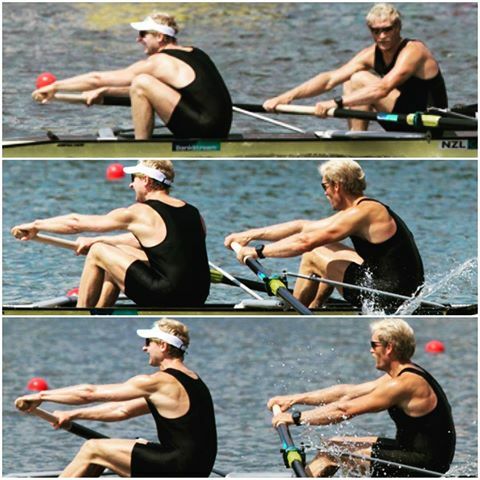 Another argument for a sequential rowing style. In section 31.3, Kleshnev discusses the use of inertial energy. On page 75 he talks about the deceleration of your body. On the water, the deceleration doesn’t really take place. On the static erg, the deceleration in the second half of the drive can be achieved by pulling the chain with the arms, thus transferring your body’s kinetic energy to the flywheel (so it is useful energy, not wasted), and the only waste happens on the recovery, when you slow down before taking the catch. Here, Kleshnev argues that the losses can be minimized using the elastic properties of muscles and ligaments. In physics terms, this is a “negative work” situation, where your legs are using force in the opposite direction of the direction of movement. This means that energy is flowing to your body from the rest of the system, and if your legs were springs, you could “store” the energy and use it in the first part of the drive. I would love to see some scientific literature on this. Perhaps you can “bounce back” a little, but I do think that most of this “negative work” is lost, with your legs working more as a damper than as a spring. An interesting point is made on the catch, on page 100 and further. Reading the newsletters, I always had difficulties with Kleshnev’s terms “catch through the stretcher” vs “catch through the handle”. Newton’s law (action is reaction) still applies, so I thought that a force on the handle has to be balanced by a reaction force on the stretcher, and the difference between the two terms wasn’t clear to me. A key figure is figure 4.9, where you can see what the author means by “catch through the handle”. It is just another way of saying that you open up your body. Aha! We are talking about two very distinct rowing styles here. That makes everything clear. Catching through the stretcher: Do not open up your body. Another way of talking about a front loaded stroke, using exclusively the legs in the first part of the drive. By measuring your own stroke and analysing it, you can work on achieving the perfect stroke more often, and go faster! Because today, there are many options to do your own biomechanics measurements. A force measuring oarlock is a great tool, but even “just” video analysis and measuring boat acceleration will get you started. Using an app like RiM, you can measure those data with your smartphone, and compare your stroke with the acceleration curves of the book. Soon, accelerometer “tags” will be cheap and will communicate wirelessly with your smartphone. Putting a few of these on key parts of the boat and your body (or embedding them in your rowing clothes), add power measuring oarlocks, and you can “Kleshnev” on every outing! With a force measuring oarlock, you can – apart from the great benefit of being able to row by power – watch your catch and finish angles, and monitor slip and wash while you row. Also, your average to peak force ratio is an indicator of your rowing style. Finally, there are some subtleties of “the perfect stroke” that we still have to discover. Every rower knows how you can get a boat upset when your stroke timing is slightly off, and we all know that different boats require slightly different stroke timing to reach Nirvana. So there is still some work to do, but for the majority of us, there is a lot of work to do to at least get close to the ideal stroke as we can measure it today. Getting Started with indoor rowing by the numbers. What are the differences between Premium and Basic on Rowsandall.com?